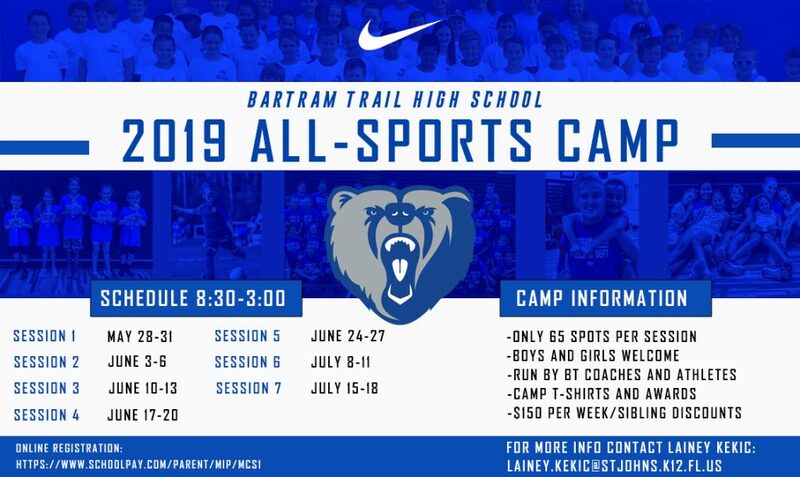 Check out what GREAT CAMPS are being offered this summer 2019 at Bartram Trail High School. Our youth sports camps will help campers improve their skills in a FUN environment. Participants will learn from the Bartram Trail Coaching Staff as well as our Varsity athletes. All camps will take place on the Bartram Trail Campus. Rising 1st through 8th grade Boys and Girls Welcome! We believe that this camp will provide players with the essential FUN-damental skills to become a great basketball player. These skills will help the player maximize their potential and improve their overall game. We look forward to helping each camper enjoy the game of basketball while improving basketball skills.